Grace Daycare & Aftercare Nursery School is a niche market Daycare and Aftercare facility with branches in Randhart - Alberton and Birch Acres - Kempton Park. Our Sister school rainbow Kidz Academy and Aftercare is based in Brackenhurst - Alberton. We strive to offer the very BEST facilities, equipment, care and services to our children and our parents. We pride ourselves in always ensuring our children’s needs are put first and we strive to constantly grow and improve on every aspect of the running of our schools. We make use of an educational program that has been developed by qualified nursery school teachers that ensures that the relevant topics and learning is acquired in order to get children ready for primary school. At our branches in Randhart and Birch Acres we cater for children aged from 15 months up to and including Grade R (Full Daycare) and Aftercare Grade 000 to Grade 7. 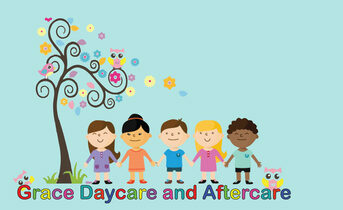 We also offer Full and Half day services as well as Holiday Care at all our schools. We are also open school holidays, if you are looking for your children for a loving environment during the school holidays Grace Daycare and Aftercare Nursery School is the ideal place.Grace Daycare and Aftercare is the best Pre-Primary School/Nursery school / Creche in the South of Johannesburg in Alberton and North-East of Johannesburg in Kempton Park. We ensure that each child gets the individual love and attention they need and deserve in order for them to flourish. © 2019 Grace Daycare and Aftercare Nursery Schools. ALL RIGHTS RESERVED.